Buy ClubLaptop Premium Compatible Laser Toner Cartridge 88A for use with HP CC388A online - Clublaptop - The largest online store by Manufacturer of Laptop Accessories and Spares. The Premium CLub Laptop brand compatible black laser or toner cartridge has been specially designed to work with your printer. This Premium compatible toner cartridge stands at par the original cartridges in terms of print quality and page outputs. It is 100% comparable to original cartridges in terms of looks, feel and finishing. This Premium CLub Laptop compatible toner cartridge is produced under strict Quality standards, using state of the art production techniques to bring out the best print quality at an economical price. Installation of this CLub Laptop compatible cartirdge is as easy as OEM cartridge. Now!! Make a professional impression with crisp black-and-white documents, page after page. Compatible Printer Models: HP LaserJet P1007,P1008?,M1136, M1213nf,M1216nfh,P1106,P1108. Disclaimer: Warranty doesnot apply to products that has been tampered or experienced problems resulting from missuse and/or improper storage. Clublaptop is not liable for any indirect consequential or incidental loss/damage. Warranty is limited to replacement of product or refund of purchase price. In case you have doubt or confusion Call us at 9331 39 39 40 or click on LIVECHAT. 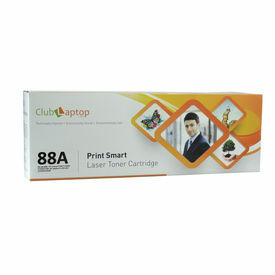 ClubLaptop Premium Compatible Laser Toner Cartridge 88A for use with HP CC388A The Premium CLub Laptop brand compatible black laser or toner cartridge has been specially designed to work with your printer. This Premium compatible toner cartridge stands at par the original cartridges in terms of print quality and page outputs. It is 100% comparable to original cartridges in terms of looks, feel and finishing. This Premium CLub Laptop compatible toner cartridge is produced under strict Quality standards, using state of the art production techniques to bring out the best print quality at an economical price. Installation of this CLub Laptop compatible cartirdge is as easy as OEM cartridge. Now!! Make a professional impression with crisp black-and-white documents, page after page. Clublaptop compatible laser toner cartridge Features >Manufactured from best quality components >Highest page yield >100% compatible with OEM cartridge >Quality test of 100% products >Safe and attractive packaging Product Features Brand Clublaptop Model Number COMP CL HPK 88A Color Black Type Toner Cartridge Page Yield 1500 pages at 5% Coverage Area Warranty Type Warranted to be free from defects in materials and workmanship Compatible Printer Models: HP LaserJet P1007,P1008?,M1136, M1213nf,M1216nfh,P1106,P1108. Disclaimer: Warranty doesnot apply to products that has been tampered or experienced problems resulting from missuse and/or improper storage. Clublaptop is not liable for any indirect consequential or incidental loss/damage. Warranty is limited to replacement of product or refund of purchase price. In case you have doubt or confusion Call us at 9331 39 39 40 or click on LIVECHAT.